Hello Temarius! Thank you for speaking with us today, we’re looking forward to discussing your work and finding out more about your practice and professional career so far. Firstly, could you introduce yourself and share your personal design philosophy? Hello everyone and thank you Michelle for taking the time to conduct this interview and allowing me to discuss my journey as an artist and some thoughts behind my work. I am a concept artist/illustrator residing in the SF Bay Area and I currently work for Apple Inc. I graduated in 2015 with my Bachelor’s of Fine Arts in Game Development and I began working in the gaming industry in 2016. I am a versatile artist who believes that effective design must communicate a message to an audience and tell a memorable/dynamic narrative. My mission is to serve the diverse needs of creative projects, cultivate beauty, and manifest the dreams of my clients into reality and spread happiness across the globe by producing content that provides unforgettable experiences. You work as a Concept Artist and Illustrator for the games, film and entertainment industry. Can you talk us through your creative process and explain the intent behind your work? I essentially develop ideas for commercial products that are distributed to a global audience. My creation process always begins with generating ideas. My job as a Concept Designer is to generate new ideas that can potentially be used for a video game or a film. I begin my creative process by discussing the needs of the project with my client/art director and reviewing a brief. Then I proceed to gather references for my work and generate a series of thumbnails. Usually the client will pick the thumbnail he/she feels works best for the project and I will continue to work on it. During the creative process there is an ongoing channel of communication and iteration to my ideas as well. Once the client is pleased with the outcome of the design/assignment, my work is finished and then given to the rest of the art team to use as a visual asset for a film/game etc. A large portion of your commercial portfolio, primarily concept art, consists of fantastical landscapes and characters produced using digital media. However, you are also a student of traditional media, techniques and subject matter. Does having a comprehensive understanding of traditional painting assist your digital artwork? If so how and is this a skillset you would recommend developing for aspiring concept artists? Having a strong understanding of traditional painting is a crucial element to producing my digital work. Before I decided to become a concept artist in 2014 I spent years learning traditional painting techniques and experimenting with many different kinds of media. As a result, I am able to translate those skills and techniques into my digital work and create pieces that emulate traditional media. I can freely create photo-realistic artwork or painterly designs depending on the needs of my client. My background as a fine artist has also helped me develop a versatile skill set. I would highly encourage aspiring concept artists to take traditional painting classes to understand the properties of light and color within a broader context. These experiences will become an asset to anyone who aspires to create concept art and believable worlds. We are very pleased to be featuring your work in Drawn Volume.3, Leaders in Contemporary Illustration. Could you tell us about the work you’re showcasing within the publication and walk us through how you created ‘Astral FFXV’? I’m super excited and incredibly grateful to have my work featuring in the publication of Drawn Vol.3 as well! 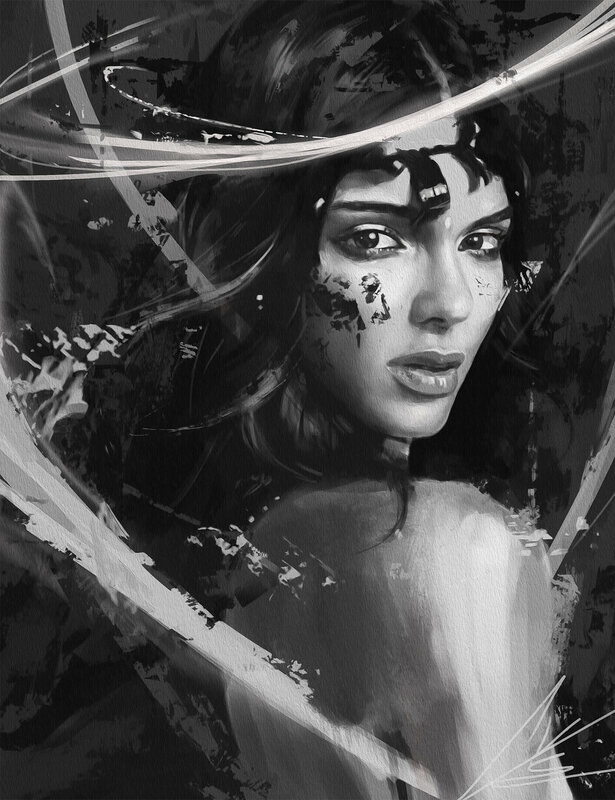 I had alot of fun painting a portrait of Kendall Jenner, a fashion icon who has inspired many runway models and designers within her industry. I also wanted to portray her in an artistic manner to amplify her natural beauty. I truly hope that she enjoys and gets to see the fan art because it is one of my favorite pieces. Astral’s Mount FFXV was a personal piece that I designed as a potential environment locale for players to explore while playing the video game Final Fantasy XV. After spending hours gathering reference photos and reading about the mythology of the series I created a few environment thumbnail sketches and then painted the finished illustration. I primarily wanted this painting to feel like a traditional environment piece so I left quite a few loose brushstrokes in this piece. Capturing the essence of traditional painting while working digitally is always an ongoing challenge. You’ve been working as a professional Concept Artist since 2012. Can you explain how you entered the games industry and share some advice for fellow creatives seeking to do the same? Here are a few words of wisdom: always have a clear objective of what you would like to accomplish and work towards it each day. When I was 19 I made it a priority to practice building my skills each day so that I could gain professional experience in my field. One of my former classmates noticed a sketch that I completed for HW during my studies at the Academy of Art University and asked if I could help him out with a project for a company known as RockBridge Productions. Although the gig was quite short I completed concept art for two unreleased indie films and gained invaluable experience in my field. After that opportunity I began to work on projects with my instructors at the Academy of Art University and eventually began freelancing after I graduated. The best piece of advice I could give to younger aspiring concept artists is to never give up and always follow your dreams. Having mentors, networking and developing professional relationships with individuals in your industry will give you a competitive advantage over others in your field and allow you to learn/grow even faster! You are the Founder and Creative Director of Neo Vitale Design Studio (est. 2013) What is the biggest challenge you have faced as a creative entrepreneur, and how did you overcome it? Yes! I am the Creative Director and Founder of my own design studio and this year has been quite busy so far. While not working on projects with Apple Inc. on the other side of the Bay Area I am interacting with various clients and completing different design projects. Prioritizing competing demands between multiple clients and managing multiple deadlines under a tight schedule is one of my greatest challenges as a creative entrepreneur. I was able to overcome this obstacle by evaluating my schedule and setting realistic goals to meet each clients needs. If my schedule is too busy I will turn down projects for the sake of my own mental/physical health. Always take care of yourself because it is your responsibility. You reside in San Francisco, a city synonymous with both technology and culture. As an artist who works within the digital space, it seems like you are living in the best of both worlds! Can you tell us about the creative scene in San Francisco and share the names of any local artists we should check out? I love living in SF and it is a beautiful city filled with inspiration and art. As a digital artist I am truly living the best of both worlds because I get to visit fine art galleries during my free time and also work within the tech industry as well. The creative scene in SF is exploding with virtual reality, augmented reality and other types of technology that companies are integrating within fine art, video games and other types of media. My favorite museums to visit are the De Young Museum and The Legion of Honor. These fine art museums feature the works of Claude Monet, Paul Gauguin, John Singer Sargent and many other artists. There are also local student artists who are also producing awesome work as well! I highly recommend checking out the work of Julia Goodwin, a photographer living in San Francisco, CA. She is graduating from the Academy of Art University this Spring and she has a stellar body of work. View her portfolio here. You’ve worked on a number of high profile projects, and you’re currently working on a top secret, unannounced project for Apple! Do you have any ‘wish list’ projects that you’d like to work on? I’m grateful that I’ve had the opportunity to be a part of a number of high profile projects! It's quite awesome and challenging each day to stretch myself and grow by learning new tools as well. Finally, could you tell us about what professional goals and projects you have planned for 2019? Right now, my biggest professional goal is to work onsite at a gaming company as a Concept Designer. I am attending the Game Developer’s Convention this year to build clientele and find new opportunities within the gaming industry. I also want to move to Tokyo, Japan by the end of 2019 to work full-time as a Concept Artist for a gaming company. One of my goals is to have a solo exhibition in New York in celebration of Women’s History Month. I was recently invited to submit my work to a panel for consideration and I am currently waiting to hear some good news. I also have a few personal projects that I am currently working on that I plan to add to my portfolio website. Perhaps one of the biggest announcements of this year is that I will be opening an online store via BigCartel.com where fans can purchase high-quality digital prints of my work! I plan to open the online store during April and I am so excited! Stay tuned for more surprises this year. My work can be viewed here and my Instagram is @LightWalker. Thank you Capsules Book for publishing my work and thank you Michelle Brook for conducting this interview. It’s our pleasure! Thank you for your time today Temarius, we are excited to see your new projects come to life!